It is very tough to select only a few GK questions for kids as it is a vast area and in fact boundless. Some of the questions may seem too simple for higher class students but it is always good to revise what you know before you add in more information to your knowledge base. Here we can have a look at some of the randomly picked basic GK questions for kids of all ages. 1. How many days do we have in a week? 2. How many days are there in a year? 3. How many colours are there in a rainbow? 5. How many letters are there in the English alphabet? 6. How many consonants are there in the English alphabet? 7. How many sides are there in a triangle? 8. In which direction does the sun rise? 9. What do you call a type of shape that has five sides? 10. Which month of the year has the least number of days? 11. Which is the largest flower in the world? 12. Which are the vowels in the English alphabet series? 13. How many zeros are there in one hundred thousand? 14. How many hours are there in two days? 15. How many months of the year have 31 days? 16. How many weeks are there in one year? 17. Which are the colours in a rainbow? 18. Which animal is called King of Jungle? 19. How many bones does an adult human have? 20. Who was the first man to walk on the moon? 21. How many primary colours are there? 22. Which way is anti-clockwise, left or right? 23. How many equal sides does an isosceles triangle have? 24. How many millimetres are there in 1cm? 25. How many days are there in the month of February in a leap year? 26. Which is the nearest star to planet earth? 27. What do you call a house made of ice? 28. Which is the longest river on the earth? 29. Which is the principal source of energy for earth? 30. Which is the coldest location in the earth? 31. How many lungs does the human body have? 32. What is the standard taste of the water? 33. Which country is called the land of rising sun? 34. Which is the tallest mountain in the world? 35. Which is the fastest animal on the land? 36. Which continent is known as ‘Dark’ continent? Who is the inventor of electricity? 38. Which is the largest animal in the world? 39. Which planet is known as the Red Planet? 40. Which is the tallest animal on the earth? 41. Which is the most sensitive organ in our body? 42. Which is the most spoken language in the world? 43. Which two parts of the body continue to grow for your entire life? 44. The largest ‘Democracy’ in the world? 45. Who is the inventor of Television? 46. Which is the largest ocean in the world? 47. Which is the largest plateau in the world? 48. Which is the instrument used to measure Blood pressure? 49. Which day is observed as World Environment Day? 50. How many years are there in a century? 51. Which is the largest country in the world? 52. Who invented the Computer? 53. Which festival is known as the festival of colours? 54. How many players are there in a cricket team? 55. Which day is observed as World Literacy Day? 56. Who is the inventor of Radio? 57. What colour symbolises peace? 58. Who is the founder of Microsoft? 59. During which year did World War I begin? 60. Which festival is called the festival of light? 61. How many Cricket world cups does India have? 62. Which place is known as the roof of the world? 63. How many teeth does a healthy adult have including the wisdom teeth? 64. Which gas is most abundant in the earth’s atmosphere? 65. How many people are there in the world? 66. Which is the continent with the most number of countries? 67. True or false: Chameleon’s have extremely long tongues, sometimes as long as their bodies? 68. Which is the most common non-contagious disease in the world? 69. How many strings does a violin have? 70. Global warming is caused by the excess of which type of gas? 71. How many cards are there in a complete pack of cards? 72. What is the name of the biggest rain forest in the world? 73. Which African nation is famous for chocolate? 74. What makes up (approx.) 80% of our brain’s volume? 75. Which instrument is used for measuring wind speed? 76. An ostrich’s eye is bigger than its brain. True or False? 77. How many planets are there in our solar system? 78. Which is the hottest continent on Earth? 79. Which is the smallest continent in the world? 80. What is the top colour in a rainbow? 81. How many years are there in a millennium? 82. Which country is home to the kangaroo? 83. ‘Stars and Stripes’ is the nickname of the flag of which country? Which language is used by the computer to process data? 85. What type of bird lays the largest eggs? 86. What covers approximately 71% of the Earth’s surface: Land or water? 87. Which is the hardest substance available on earth? 88. Which is the biggest desert in the world? 89. Which country gifted The Statue of Liberty to the United States? 90. Who painted the Mona Lisa? 91. Who invented the telephone? 92. What is the name of the Greek God of music? 93. What does the “SIM” in the SIM card stand for? 94. Which is the first element on the periodic table of elements? 95. Which is the longest written Constitution in the world? 96. What is the largest joint in the human body? 97. What does the Internet prefix WWW stand for? 98. How much of Earth’s surface is covered by ocean? 99. Which is the smallest bone in the human body? 100. Who discovered Penicillin in 1928? 101. How many stars are there in the American flag? 102. Which instrument is used to measure Atmospheric Pressure? 103. Which is the largest continent in the world? 104. Who is the inventor of the electric Bulb? 105. On whose memory Nobel Prize is awarded? 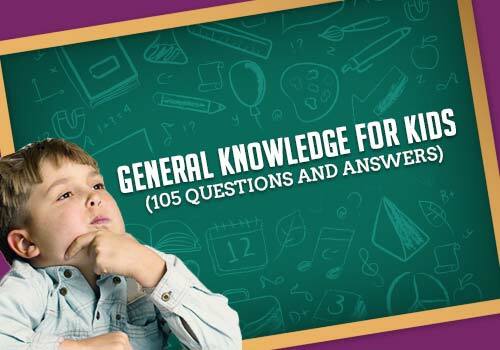 These are just a few among the most asked and discussed general knowledge questions among kids. Parents and teachers should take an effort to see that kids have at least a basic general knowledge right from their initial days. They can slowly build it through reading and research in the upcoming years.